Want to go on a horse trip while you are here, but had some place other than the Aneroid Trail Head in mind? Check with Vixen at Dun The Right Way Horses. Visit Wallowology and you`ll discover the science behind these stunning mountains, grasslands, forests, and rivers, and they will help you find new places to explore! Join them for the best Oregon or Idaho whitewater rafting trips on the Snake River through Hells Canyon, the Salmon River and the Grande Ronde River. With over 35 years of guiding experience on these rivers, the owners of Winding Waters have created an outstanding whitewater rafting adventure for you, your family, or group. Excellent backcountry skiing opportunities abound and the Wallowa Mountains of Northeastern Oregon are reputed for deep, dry, powder snow. Backcountry skiers of any skill level may find an experience to suit their desire, from gentle touring to advanced telemarking. 9 hole course lies in a verdant valley between gentle hills of wild native grass, and a scattering of basalt and firs. Add that to a panoramic view of the Wallowa Mountains, this makes the Alpine Meadows setting ideal for the game. It started when a group of people who liked to ski would appoint a volunteer, called �The Captain,� to locate a good place to ski each Sunday. They would all gather at this chosen spot and ski all day, picnic and have a great time. In order to ski down you had to climb up. If a packed slope was wanted, everyone spent time packing it with their skis. A big step forward was made in 1939 when a permanent location was selected and a rope tow constructed. The spot was on Stanley Hill, about two miles south of Joseph and a little south of where the Buhler Ranch is now. The tow was a continuous rope motivated by a Model A Ford engine. In 1948 the tow was moved to a slope at the end of what is now Ski Run Road. We will provide you with a quality hunting area. We situate our camps 3 - 5 miles apart to give you an isolated hunt; however, we cannot guarantee that a private hunting party will not camp nearby. We are the only outfitter permitted to pack into the areas you will be hunting. The majority of our hunts are Drop and Supplied Camps. Our groups are all packed in on the three days prior to the opening day of the season and packed out no later than the third day after the season ends. Since most of our seasons are at least 9 days long, we normally have all camps out by the day after the seasons closes. We try our best to accommodate your preferred date but sometimes it is necessary to pack certain groups together that are going in a common direction. We also honor first paid, first choice system when possible. We will provide you with a packer that is knowledgeable and capable of getting you and your gear packed in safely. Some of our camps do not have fresh running water and we will pack water to you in the water jugs that you provide. We will let you know if water jugs are needed at your campsite. Once the season opens, a packer will be checking on you periodically to see if you have game to pack or need additional water. The game will be packed and hung at either your campsite or our base camp. On earlier hunts with warmer weather, it may be necessary for the carcass to be taken to town to a meat locker. Your pack-out date will be previously arranged. If your group tags out early and wants to come out, we normally can make changes to meet your request. Here at Del Sol we�ve made it our mission to bring our clients the safest, and most well trained stock in the business. All of our gear is custom made by local artisans to fit our clients and horses as well as possible. All of our stock are well bred mountain horses and mules. We select only the best animals that excel in the terrain we operate in. Our horses have smooth gaits, are in good physical condition, and every animal is trained by the Del Sol crew personally. If your looking for an amazing horseback adventure into the Oregon backcountry, this is the trip for you. Give us a call to set up a trip. Ninebark Outfitters provides customized recreational opportunities based from a private lodge on Joseph Ck. Hunt, fish, hike or mountain bike and view wildlife & wildflowers along the way. We cover your rafting needs by providing vehicle shuttle services, offer guided fly fishing trips & fully guided whitewater trips. We rent top of the line rafting equipment with raft setup and pickup. We provide jet boat trips and fishing charters at the south entrance to Hells canyon. Our lodge offers you clean, comfortable lodging in a remote setting at the south end of Hells Canyon. Eagle Cap Wilderness. Hiking Maps and information. Maps of Towns in Wallowa County. About a half-mile north and adjacent to the Chief Joseph Memorial you`ll encounter Sacred Land. This 62 acre site was finally protected in 2009 through the great efforts of The Nez Perce Tribe, the Confederated Tribes of the Colville Reservation, the Confederated Tribes of the Umatilla Indian Reservation and area locals. The trails are fairly gradual and graveled for casual hiking or running. A small pond, running stream and meadows are some of the features of this beautiful park, making it a great place for a short day hike. Wildlife are naturally attracted to this relatively undisturbed park, so keep an eye out- you may be surprised by what you discover! On the north end of the lake you`ll find the county day-use area. While not nearly as expansive, it`s equipped with a great double boat ramp, tie-up dock and more than a half-dozen picnic tables. The beach is ample and it has a protected swimming area for the kids. This sunny location, due to the prevailing breeze, is typically warmer for swimmers too. It`s also where the fireworks are launched just offshore for Independence Day. Lying on your back while the shells explode overhead, completely filling your field of view while listening to the echoes boom through the mountains, redefines the whole experience for most. The Salt Creek Summit Snowpark is located adjacent to the Hells Canyon Scenic Byway (Forest Road 39) at the top of Salt Creek Summit. Popular with snowmobilers, snowshoers and Nordic skiiers, the facility has a vault toilet, large parking area and a winter maintenance facility (operated by Wallowa County). As a multi-use site, the snowmobile trails and cross country ski trails are maintained in partnership with the local clubs, and the Sno-Park is plowed under an agreement with the Oregon Department of Transporation. A State Sno-Park permit is required to use this facility in the winter season. Short trips with family and friends for a day hike along a stream or to a mountain lake are an enjoyable experience. The day hikes opportunities listed below can assist you in planning your next trip to the Forest. Self guided tours are mapped for your convenience in our pamphlet Wallowa County Historic Barn Tour. View or photograph some of the most beautiful historic barns of Oregon. Many are located on working ranches in the Wallowa Valley against the backdrop of the Wallowa Mountains. Zumwalt Prairie, northeast of Enterprise, is one of Oregon�s premier sites for observing Birds of Prey. Herds of elk are frequently viewed from the roadside. In your pursuit of wildlife, visit the rugged Hells Canyon National Recreation Area or Eagle Cap Wilderness for: bighorn sheep, black bear, cougar, elk, mule deer, mountain goats, and wolves. The Nature Conservancy manages a preserve on the Zumwalt Prairie. Drive the Hells Canyon Scenic Byway to Explore The Wallowas � one of the 7 Wonders of Oregon! The Nez Perce Center, located in the City of Wallowa, is the home of the Wallowa Band Nez Perce Homeland Project. Hear the tragic story of Chief Joseph as he led his people from the Wallowas along the Ne-Mee-Poo trail to escape the U.S. Army. For an inclusive display of Nez Perce photos visit the Nez Perce Photo Exhibit on Main Street, Joseph. Nez Perce Interpretive Center (541) 886-3101. The emergence of the Maxville Project reflects the local community`s deep appreciation for the preservation of its oral history, photographs, historical structures, and forested landscape. Maxville Heritage Center (541) 426-3545. For a real unique experience tour the Antique Tractor Exhibit on a working farm. Located on Alder Slope, outside of Enterprise, is Oregon`s largest collection of historic, restored tractors and other pioneer treasures. Open 12 months by appointment. Sunrise Iron, (541) 426-4407. Classic Multi-day Ride (Shown in Yellow) Northeast Oregon is home to one of Oregon`s premiere cycling experiences: a trip around and through the Wallowa Mountains. This route is a favorite of Cycle Oregon`s annual "week ride". Day 1: Elgin to Union This mostly flat route travels 45 miles through theGrande Ronde Valley. Day 2: Union to Baker City Another 45-mile day, this route includes several climbs, including one over 1500 feet. Day 3: Baker City to Halfway This 52-mile ride follows the Powder River before heading into the Wallowa Mountains. A steep 1200-foot climb preceeds the final descent into Halfway. Day 4: Halfway to Wallowa Lake A challenging 77-mile day that travels through Hells Canyon National Recreation Area and the eastern portion of the Wallowa Mountains: two major climbs, with an elevation change of 3900 feet. Day 5: Wallowa Lake to Elgin This 58-mile day traverses the north side ofthe Wallowa Mountains. The ride is mostly downhill, but includes a steep 1100-foot climb up Minam Grade. Salt Creek Summit Climb (Shown in dotted pink) A challenging 37-mile return route from Joseph, this spur travels into the heart of the Wallowa Mountains. The scenic ride has an elevation gain of 2000 feet, including a steady 1800-foot climb along a winding road. No shoulders; light to moderate traffic. Follow Imnaha Hwy to the junction of USFS road 39 (mile post 8), then turn right. Access mountain trails from Salt Creek Summit (see left). Looking for a great trail in Wallowa Lake State Park, Oregon? AllTrails has 7 great hiking trails, forest trails, dogs leash trails and more, with hand-curated trail maps and driving directions as well as detailed reviews and photos from hikers, campers, and nature lovers like you. Ready for some activity? There are 4 moderate trails in Wallowa Lake State Park ranging from 10.4 to 36.1 miles and from 5,042 to 8,395 feet above sea level. Start checking them out and you`ll be out on the trail in no time! Housed in a beautiful log building on Joseph�s Main Street, the Josephy Center for Arts and Culture provides a gathering place to celebrate, promote and inspire arts and culture in Wallowa County. We offer an eclectic blend of programs that serve local and regional arts and culture enthusiasts of all ages, as well as tourists and visitors from outside the area. In conjunction with our regular art exhibits, we host artist lectures, musical performances, films, and art classes and workshops for kids and adults. Students at the Josephy Center explore drawing, painting, print-making, photography, drama, film, and sound and video engineering. The Josephy Library not only provides the community with a rich cultural resource of written and recorded works about Wallowa County and the West, but also offers bi-weekly brown bag lunch presentations about topics ranging from the work of scholar and author Alvin Josephy (for whom the center is named) to the history of local agriculture, the development of local fisheries, and women in Wallowa County. In 2010 a group of artists and dedicated community members came together and developed the concept of a community art center. With funding from the Meyer Memorial Trust, this group contracted the North East Oregon Economic Development District to complete a Feasibility Study and Business Plan. In 2012, a generous patron purchased the log building. With that and a grant from Community Bank, the Josephy Center for Arts and Culture was born. With overwhelming support from the community, the Josephy Center now offers a variety of programs and events, while also offering a venue for other local organizations to host performances, presentations, and meetings. Keep an eye on our calendar for details. Gallery hours are open Monday through Friday from 10:00 am. to 5:00 p.m, and Saturday from noon � 4 p.m. Center will be open at scheduled hours for special events and workshops. Check our calendar for details on times. From Enterprise, take Hwy 82 towards Joseph. About 3 miles from Enterprise, turn left on the Crow Creek Road at the Eggleson Corner. Stay on this road and follow the signs to Buckhorn Lookout and Zumwalt. At approximately 5 miles, just pass the "Blue Ridge Cattle Company", take a right on the Zumwalt Road. You will travel for many miles over the high, rolling grasslands known as the Zumwalt Prairie. The Nature Conservancy owns and manages a 33,000 acre preserve which includes public access. This prairie covers approximately 160,000 acres. The Preserve represents the last remaining, relatively undisturbed, grassland ecosystem of bunch grass in the Pacific Northwest. The prairie on the preserve is dissected by steep canyons and grasslands as well as pine woodlands, quaking aspen groves, and spring-fed riparian ecosystems. The preserve includes one of the Findley Buttes, a volcanic cone, surrounded by as expansive vistas of grass-dominated prairie rich in flowering plants. Viewing birds, wildlife, and the open prairie is the experience of the Zumwalt Prairie! Elk herds are common along the ridges and benches of the canyon lands visitors with an eagle-eye. The Zumwalt is home to an array of breeding raptor species including the grassland-dependent Ferruginous Hawk as well as the Swainson Hawk and Prairie Falcons. Travel just a little further to reach the Buckhorn Overlook. You will need to watch for a spur road to the right (F.S. Rd.780 to F.S. Rd.810). At the Buckhorn Lookout you will be treated to grand views of the lower Imnaha Canyon and the ridges leading into Hells Canyon. When you`ve had your fill of magnificent views retrace your route back to Forest Service Rd. 46. You now have the option of retracing your route back to Enterprise or completing the Loop by continuing on F.S. Rd. 46. This road will take you through the heart of the northern Wallowa-Whitman National Forest, eventually joining Oregon Hwy. 3 north of Enterprise. This is an all day trip with no services along the loop. Cell phone coverage is limited. Be sure to bring water, food, and a map. 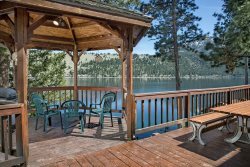 Wallowa Lake is one of the most beautiful parts of Wallowa County and is the location where the World Record Kokanee was caught, a fish over 27� long! We fish Wallowa Lake from a custom-built 23� jet boat equipped with a very quiet electric trolling motor, the latest in downrigger and sonar technology, and even autopilot. Kokanee are our favorite fish in the world to eat and fishing for them, although technical, is very relaxing and enjoyable. Kick back on leather seats and let the boat do the work until it is your turn to reel in these delicious chrome colored fish from the clear glacial waters of this beautiful lake. Trips are four or six hours. All details and updated stocking schedule and maps provided from the ODFW.